Victor “Punk” Woodley has had a tough week. 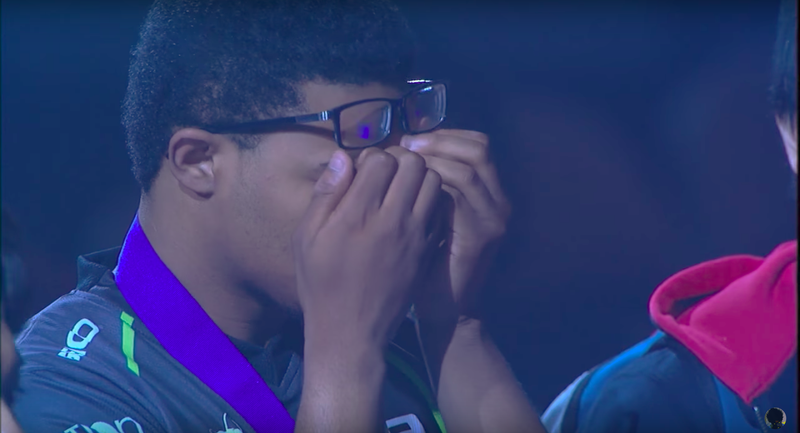 After months of first-place finishes on the Street Fighter V competitive circuit, most notably the $150,000 top prize in the Eleague SFV invitational, Punk experienced serious heartbreak in the Evo 2017 finals this past Sunday. Evo is the biggest, longest-running fighting game tournament in the world, and therefore, home to the most important Street Fighter tournament of the year. In the end, the 18-year-old Street Fighter player placed second. It’s quite an achievement to earn second, but it wasn’t enough for Punk. After accepting his second-place medal on the Evo 2017 stage, Punk buried his face in his hands. That night, he tweeted, “Let everyone down I’m so disappointed in myself.” In response, Punk’s friends and fans appeared in droves to cheer up the young Street Fighter player. Everyone’s proud of you. Nobody feels let down by you. You made it all the way to finals, and everybody has no doubt that you’ll do it again. Fall down once, get up twice. Fall down seven times, get up eight. See you in the finals next time. Fellow wrestler Kenny Omega tweeted the video from his own account, describing it to Punk by saying, “A friend of mine wanted to make sure you saw this.” Just in case you had any doubt that pro wrestlers are legit Street Fighter fans, Kenny Omega recently gave a shout-out on an NJPW broadcast to Hajime “Tokido” Taniguchi, the 32-year-old Japanese Street Fighter player who defeated Punk in the Evo 2017 finals. Given that Punk is already a phenom at 18, he’s got plenty of time to catch up to veterans like Tokido. In a later tweet, Punk promised to “take it for America next year,” in reference to the fact that American players have yet to take home the gold in Street Fighter IV or V at Evo. So long as Punk heeds the advice of his equally versatile namesake, he’s got a shot.